Last year, the United States faced many extreme weather-related occurrences including hurricanes, wildfires, tornadoes, heat waves and extreme cold. According to the National Oceanic and Atmospheric Administration (NOAA), in 2017 damage costs from these events exceeded $300 billion. Not only did the damage include buildings and structures, it also included signs, roads and other everyday structures that often get taken for granted. Now that it’s time to repair and rebuild, instead of duplicating the same projects, many organizations are working to repair the damages using resilient features. One of these features is adaptive design for extreme weather events. Companies are implementing this feature into their building and construction practices by using environmentally-friendly building materials and adaptive features for extreme weather conditions. Adaptive design features include additional absorption, resistance, deflection and restorative properties, especially in the building material. 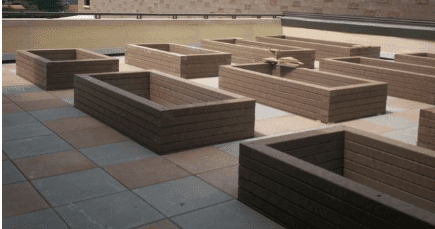 Along with resiliency for extreme weather environments, aesthetics is also an important feature for long-term staple structures including raised garden beds, signage and speed bumps. You may be wondering why it matters if a raised garden bed looks “pretty”, but it is part of a large beautification movement that many cities are involved in. It’s just “just another sign”, rather, the look and design of these structures is important and are a part of a larger movement to increase the aesthetic so that it fits with the overall look and feel of the area. “Streetscape” projects are often built using concrete, metal and wood. However, another way for companies to implement these resilient features and plan for long-term use is to think about the material that the application is made of. While concrete, metal and wood break down with all of the wear-and-tear of everyday usage, building with a product that will stand up to harsh weather environments will help increase profitability over time. Low-maintenance costs and long life-cycle are characteristics that will help to continue to uphold the initial look and feel without deterioration. These two product lines, both durable and strong, offer unique components to consider for your city projects. Our products come in industry leading color options to fit the aesthetic of the area you’re working with. As the foundation of other Bedford Technology products, SelectForce® by Bedford Technology is a durable and long-lasting product. It can be custom-molded and also comes in traditional lumber profiles sizes. FiberForce® by Bedford Technology has increased rigidity. Fiberglass strands are added and has many characteristics suited for structural applications where wider span, dimensional stability and increased flexural strength is required. Signage – Whether it’s an entrance sign, trail marker or a large site sign, graffiti often finds its way on to each of these types. With products by Bedford Technology, the plastic lumber is resistant to graffiti and splintering. Any sign can have epoxy lettering or indicators for long-life and easy viewing. Speed Bumps – With this application it is extremely important to ensure that the structure remains intact. Instead of using concrete, which will break down and can crack in extreme weather conditions, use products by Bedford Technology and lower your maintenance costs over time. Ready to Beautify Your City with Long-Term Resilient Structures? Contact us today to learn how our structural plastic lumber can make a difference for your city and park projects! Calling All Independent Sales Reps!